Former Australian test and one day international cricketer, international cricket coach. 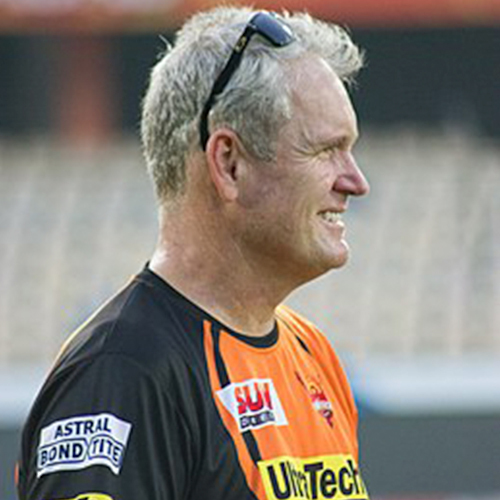 “Long” Tom Moody, so nicknamed for his 2.00 metre (six foot six inch) height, began his playing career for Western Australia in the summer of 1985/86. Tom captained his state to numerous successes and also captained in England where he carried out a distinguished career as an overseas player for both Warwickshire and Worcestershire. Tom played 300 first class matches, amassing 21,001 runs (avg.46.25) and taking 361 wickets (avg. 30.70), and played 366 one-day matches, scoring 11,258 runs (avg. 38.82) and taking 257 wickets (avg.30.02). He played in five Sheffield Shield winning teams and four domestic one day championships in Australia, and in England he was part of two winning finals at Lords. Tom’s international career began in 1987 when he was a member of Australia’s historic first World Cup win, and ended in 1999, just months after he played a key role in Australia’s second World Cup success in England. In between he developed a reputation as a dependable all-rounder capable of turning a game, either with the blistering power of his bat, or his uncanny knack to snare important wickets with the ball. His test career was restricted to just eight matches, but in that time he made two centuries – the first in just his second test match, and the second would come on his home turf at the WACA Ground in Perth against India. At the completion of his distinguished playing career he took on a full time role with Multiplex Constructions, with whom he had been involved on a part time basis throughout his playing career. Tom then took charge for five years as Director of Cricket at Worcestershire. His arrival as the County’s first Director of Cricket resulted in an era of success. After finishing sixth in the second division of the County Championship in 2001, Tom rebuilt the squad and success was to follow. In June 2005 Tom was appointed Head Coach of Sri Lankan cricket where he took on the responsibility to mount the team’s 2007 World Cup campaign. During his tenure he transformed the Sri Lankan team into a well drilled professional outfit and quickly gained the reputation as one of the game’s most sought after international coaches. Outside the One Day arena Sri Lanka rapidly improved its test match record away from home removing a long standing lack of self belief and confidence in the team abroad. In 2007, the WACA announced Tom’s appointment as manager and head coach of the Western Warries for the next three years. He also coached Kings XI Punjab for the first season of Indian Premier League. He then then began cricket commentary around the world as well as covering some Australian test and ODI Cricket for Channel Nine and the Big Bash League for Channel Ten. In 2012, it was announced that Tom would coach the new IPL Sunrisers Hyderabad team. Over the course of the 2012-2017, Sunrisers Hyderabad have reached the qualifier rounds three times and won the championship in 2016. Tom has also represented the Australian Cricketers’ Association as an executive and was soon after appointed President by his peers in 2000. He has also been awarded numerous awards including Wisden Cricketer of the Year 2000, Australian Sports Medal in 2000, and the Centenary Medal in 2003. Tom’s long involvement in the game has been recognised over recent years with appointments to two significant consultancy roles. The first as International Director of Cricket for the Caribbean Premier League and the second appointment in 2014 as Director of Cricket with the Melbourne Renegades in the Big Bash League. In 2017 it was announced that Tom would be appointed as head coach of the newest team (Multan Sultans) in the Pakistan Super League for the 2018 season.